It was an amazing summer for us at Flash Point . 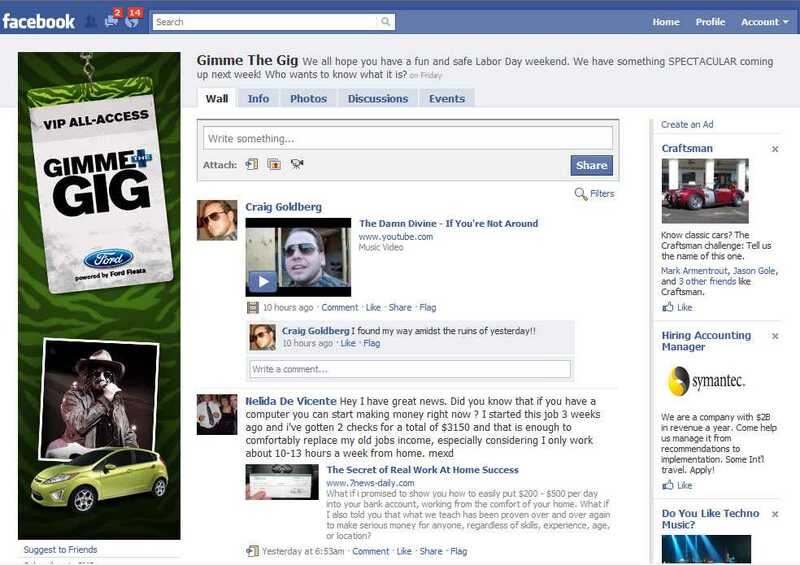 One of our most recent adventures was developing and launching a campaign for the folks at Ford. 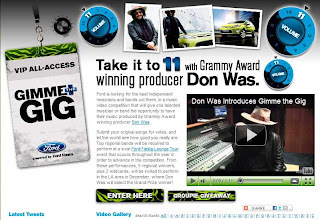 Gimme The Gig is an integrated campaign to launch the 2011 Ford Fiesta in the western half of the US, led by one of our Ford clients, Tom Grill. He had a vision. Find an interesting way to promote the all new Ford Fiesta while touching a main passion point with the target demo - which is music. The vision was to reach out to bands across the Western United States and see if we could encourage them to submit their music. At stake? A chance to get produced by the legendary Don Was. All the bands needed to do is submit a video of a performance of an original song online, have their fans vote them on the Fiesta Lounge Tour (and each person who voted received a Fiesta fun fact), and then play at one of the 75 Fiesta Lounge Tour dates all along the western part of the country for a shot at the finals. Here's the video Don did for us to help promote the campaign. Once the basics were covered, it was time to kick it up a notch. Mr. Grill didn't want to do an ordinary music submission contest. He challenged us to come up with more. ...and we think we did. The campaign consisted first of a basic music submission website called "Gimme the Gig", which we developed. Over 900 bands submitted their music in about 90 days. Last month (August, 2010), the site generated over 40,000 visits. Based on the 90-day trend, we expect that number to grow this month. Next, we developed a Facebook page, which supports the entire Western United States. This is proving invaluable to get the word out, talk directly with local bands, support all the dealers that make up the groups and even get really good feedback from the fans of bands. Integrating with local events throughout the US, we brought (and are bringing) the campaing to life with local bands, input from local folks and pictures and video from music fans throughout the Western United States. But there's no question that one of my favorite pieces is the complementary video. You see, along with Don Was, we got some help from extreme athletes and some amazing Dancers. Help from Kaba Modern (America's Best Dance Crew), pro surfer Erica Hosseini and pro skateboarder Sergie Ventura, lifted the campaign to a whole new level.